Germs, some of which are dangerous, multiply fast in temperature above 50. 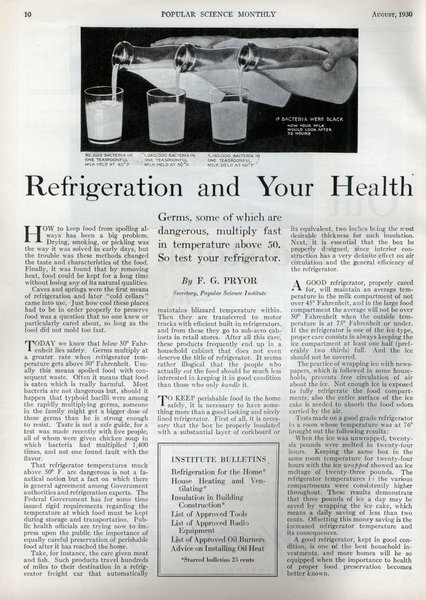 So test your refrigerator. 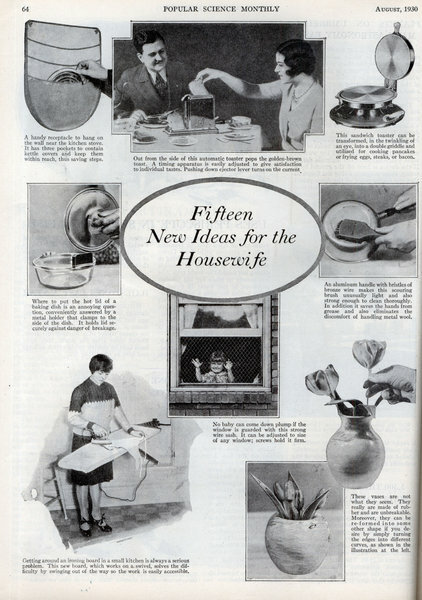 By F. G. PRYOR Secretary, Popular Science Institute HOW to keep food from spoiling always has been a big problem. Drying, smoking, or pickling was the way it was solved in early days, but the trouble was these methods changed the taste and characteristics of the food. Finally, it was found that by removing heat, food could be kept for a long time without losing any of its natural qualities. 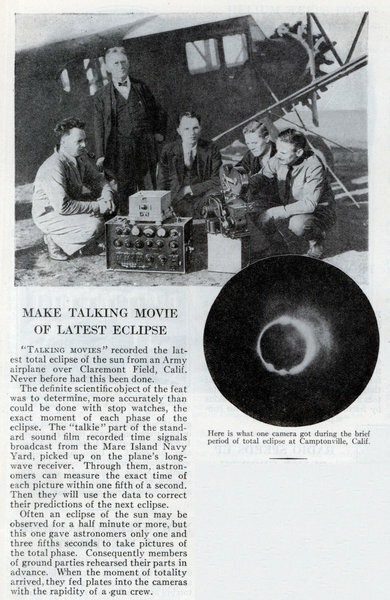 "Talking movies" recorded the latest total eclipse of the sun from an Army airplane over Claremont Field, Calif. Never before had this been done. The definite scientific object of the feat was to determine, more accurately than could be done with stop watches, the exact moment of each phase of the eclipse. AMERICA'S only planetarium, a million-dollar project, was opened recently on an artificial island in Lake Michigan just outside Chicago. A planetarium is a building in which points of light, representing stars and planets, are projected against a dome by means of illuminated stereoptican slides to show spectators the movements of the heavenly bodies. This is accomplished by a huge, scientifically accurate projection machine. Making a full-rigged model that folds so as to enter the neck By E. ARMITAGE McCANN "HOW did it get there?" 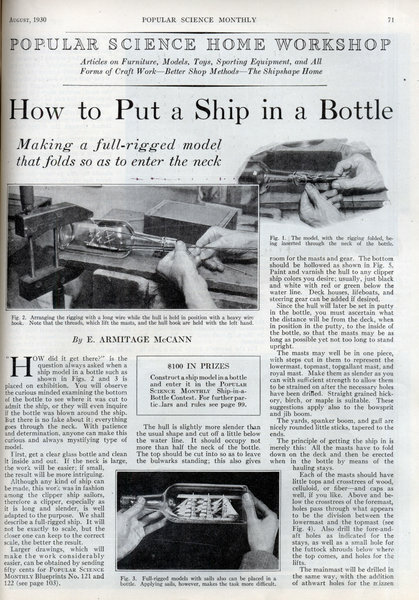 is the question always asked when a ship model in a bottle such as shown in Figs. 2 and 3 is placed on exhibition. You will observe the curious minded examining the bottom of the bottle to see where it was cut to admit the ship, or they will even inquire if the bottle was blown around the ship. But there is no fake about it; everything goes through the neck. With patience and determination, anyone can make this curious and always mystifying type of model. 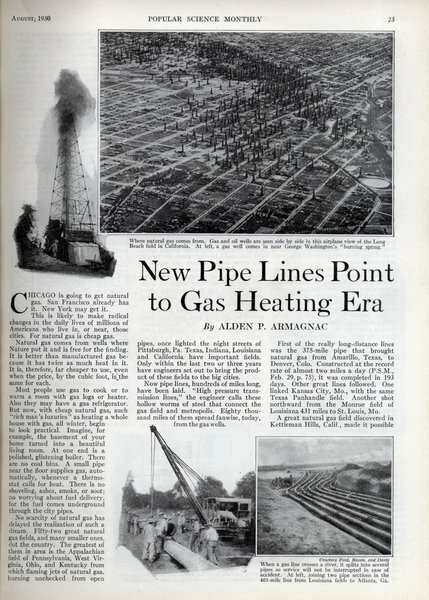 By ALDEN P. ARMAGNAC CHICAGO is going to get natural gas. San Francisco already has it. New York may get it. This is likely to make radical changes in the daily lives of millions of Americans who live in, or near, those cities. For natural gas is cheap gas. Natural gas comes from wells where Nature put it and is free for the finding. It is better than manufactured gas because it has twice as much heat in it. 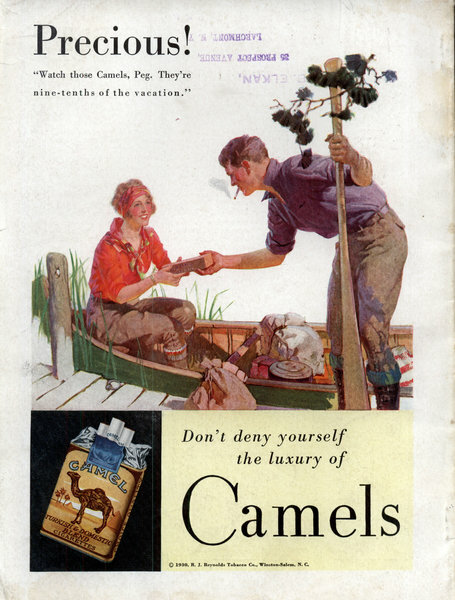 It is, therefore, far cheaper to use, even when the price, by the cubic foot, is the same for each. 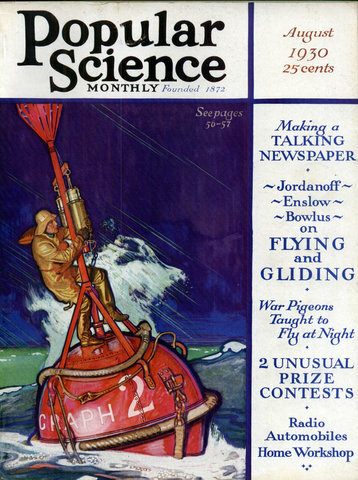 A new invention for amateur astronomers is said to make self-instruction in the secrets of the skies easy and absorbing. It is a homemade planetarium, which reproduces in miniature the dome of the heavens, showing the planets and constellations mapped out in their proper positions. 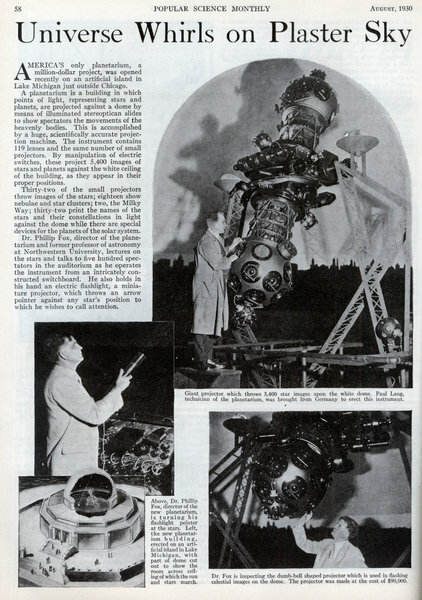 The unique contrivance was constructed by a New York City inventor from simple frame parts of metal and wood, while an old umbrella hood served for a dome. It rests on wheels so that it can be moved about without difficulty. Inventive genius takes big strides in Germany but delays in our patent office discourage American ingenuity. 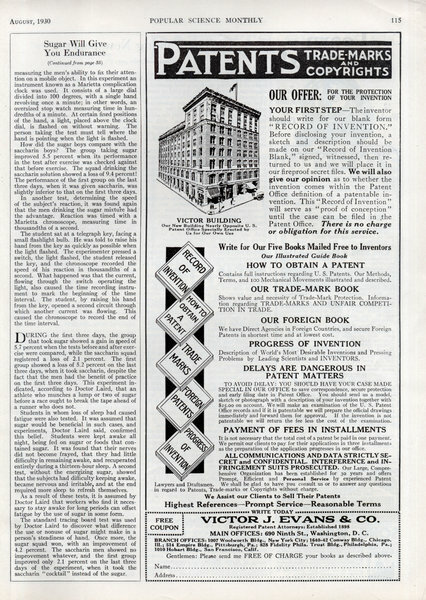 How British system of printing "abridgements" or condensed versions of patents that have been issued helps inventors. 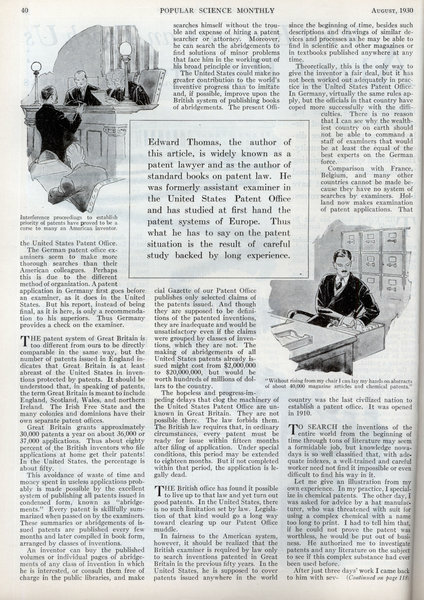 By EDWARD THOMAS THE United States has lost its world leadership in inventive progress. 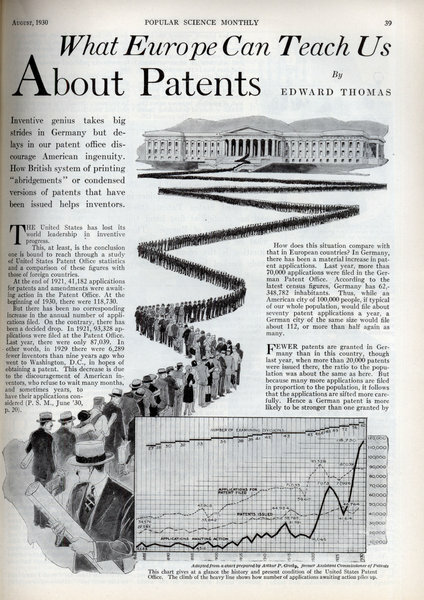 This, at least, is the conclusion one is bound to reach through a study of United States Patent Office statistics and a comparison of these figures with those of foreign countries. How tough is a piece of meat? 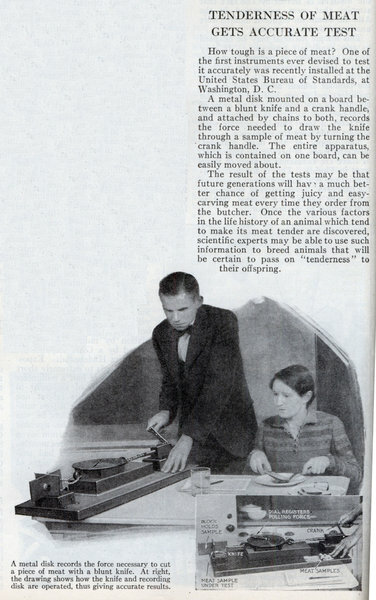 One of the first instruments ever devised to test it accurately was recently installed at the United States Bureau of Standards, at Washington, D. C. A metal disk mounted on a board between a blunt knife and a crank handle, and attached by chains to both, records the force needed to draw the knife through a sample of meat by turning the crank handle. 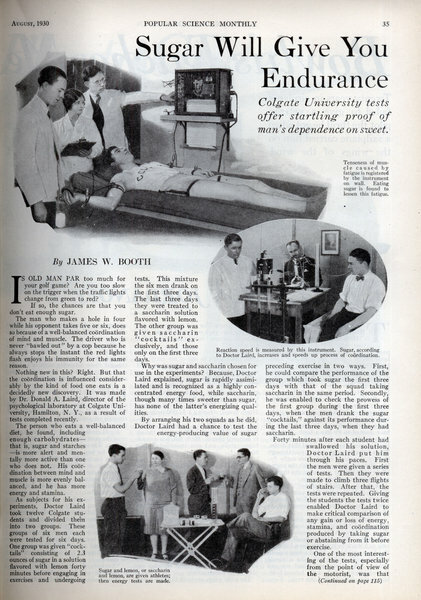 Colgate University tests offer startling proof of man's dependence on sweet. By JAMES W. BOOTH IS OLD MAN PAR too much for your golf game? Are you too slow on the trigger when the traffic lights change from green to red? If so, the chances are that you don't eat enough sugar. The man who makes a hole in four while his opponent takes five or six, does so because of a well-balanced coordination of mind and muscle. The driver who is never "bawled out" by a cop because he always stops the instant the red lights flash enjoys his immunity for the same reason. 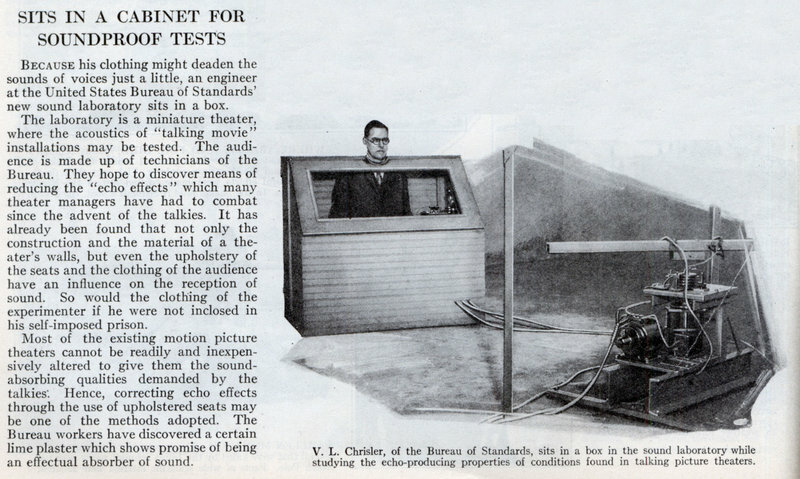 Because his clothing might deaden the sounds of voices just a little, an engineer at the United States Bureau of Standards' new sound laboratory sits in a box. The laboratory is a miniature theater, where the acoustics of "talking movie" installations may be tested. 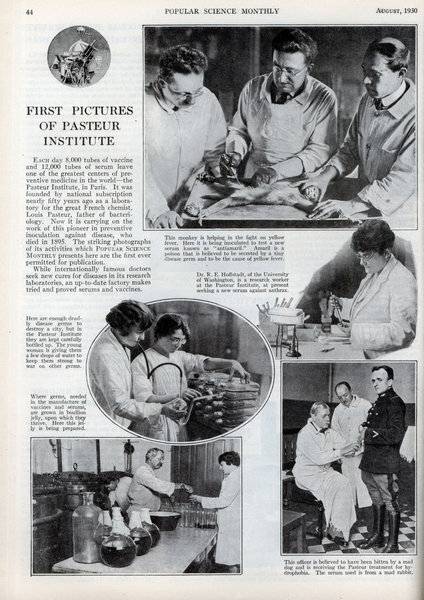 The audience is made up of technicians of the Bureau. 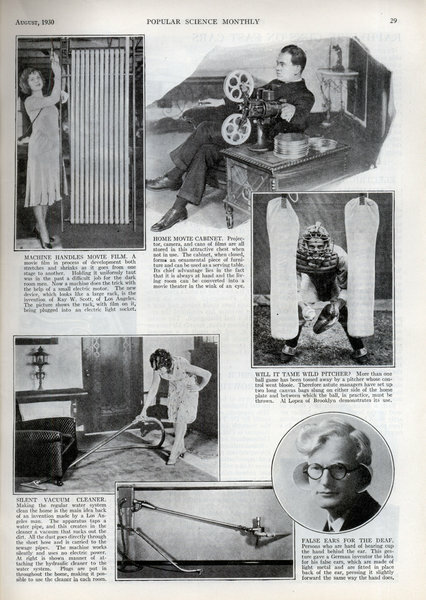 They hope to discover means of reducing the "echo effects" which many theater managers have had to combat since the advent of the talkies. It has already been found that not only the construction and the material of a theater's walls, but even the upholstery of the seats and the clothing of the audience have an influence on the reception of sound. A SLENDER spire of rustless steel tops the 1,046-foot Chrysler Building, in New York City, which officially opened a few weeks ago. Many of those who see the shaft gleaming in the sunlight wonder how it was placed at the summit of the world's tallest building. 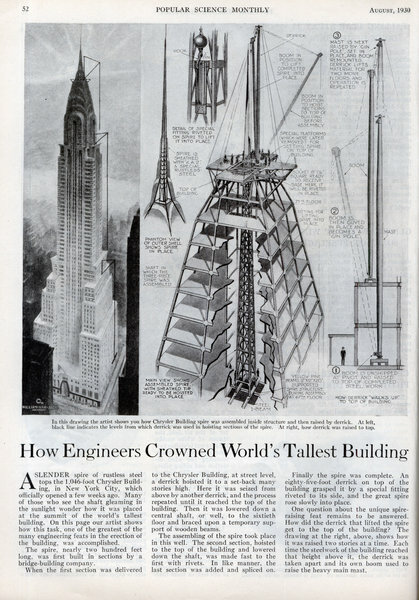 On this page our artist shows how this task, one of the greatest of the many engineering feats in the erection of the building, was accomplished. A daring attempt to drive an automobile with the terrific power of fuels like benzine burning in liquid oxygen succeeded at Berlin the other day. 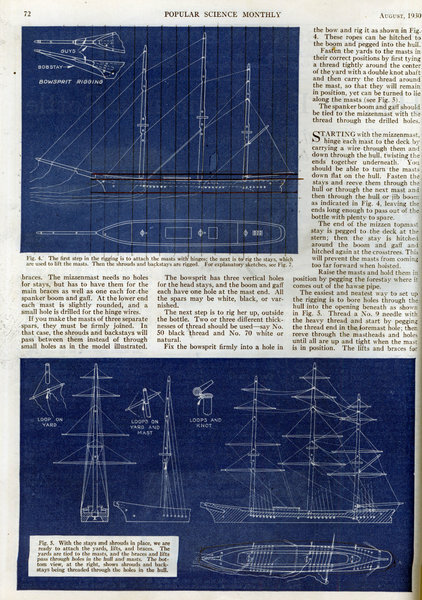 Shortly after, one of its two inventors was killed when he sought to repeat the feat. 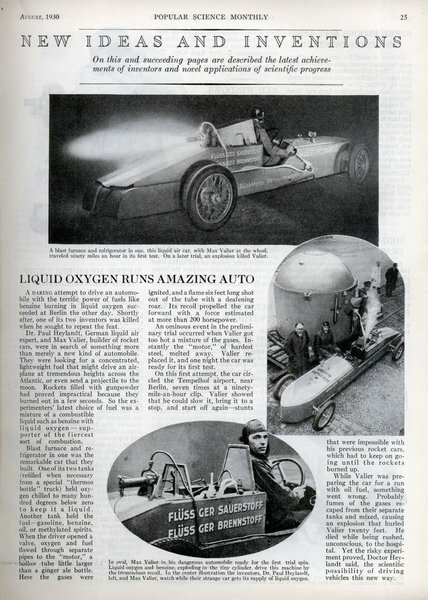 Dr. Paul Heylandt, German liquid air expert, and Max Valier, builder of rocket cars, were in search of something more than merely a new kind of automobile. They were looking for a concentrated, lightweight fuel that might drive an airplane at tremendous heights across the Atlantic, or even send a projectile to the moon. 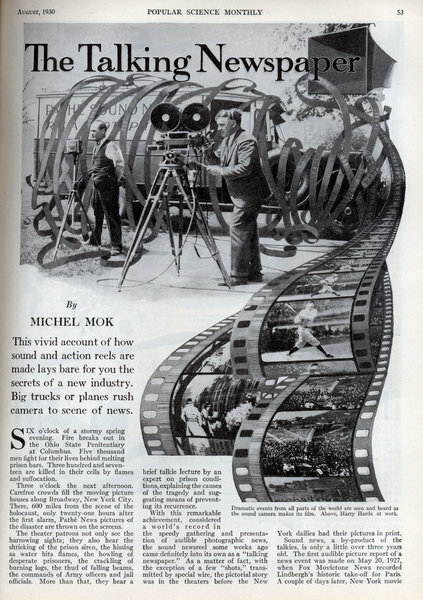 By MICHEL MOK This vivid account of how sound and action reels are made lays bare for you the secrets of a new industry. Big trucks or planes rush camera to scene of news. SIX o'clock of a stormy spring evening. Fire breaks out in the Ohio State Penitentiary at Columbus. Five thousand men fight for their lives behind melting prison bars. Three hundred and seventeen are killed in their cells by flames and suffocation. Three o'clock the next afternoon. Carefree crowds fill the moving picture houses along Broadway, New York City. 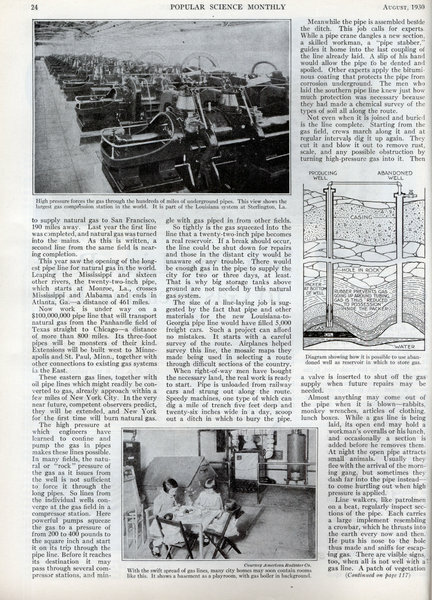 There, 600 miles from the scene of the holocaust, only twenty-one hours after the first alarm, Pathe News pictures of the disaster are thrown on the screens. 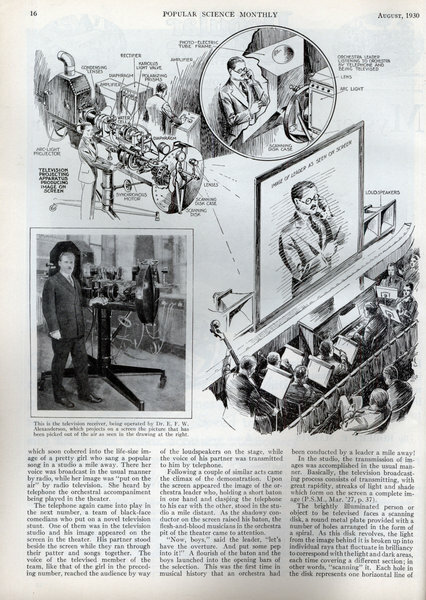 Remarkable demonstration in theater shows big improvement in seeing and hearing by radio. New process used to aid planes blinded by fog. 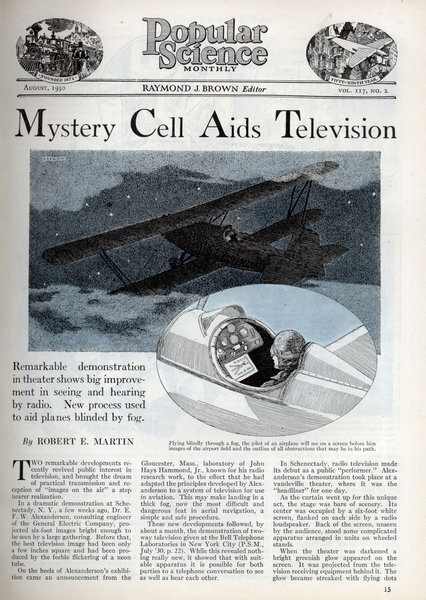 By ROBERT E. MARTIN TWO remarkable developments recently revived public interest in television, and brought the dream of practical transmission and reception of "images on the air" a step nearer realization. 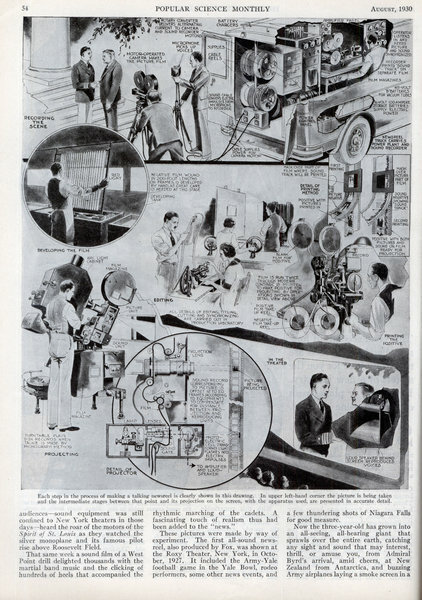 In a dramatic demonstration at Schenectady, N. Y., a few weeks ago, Dr. E. F. W. Alexanderson, consulting engineer of the General Electric Company, projected six-foot images bright enough to be seen by a large gathering. Before that, the best television image had been only a few inches square and had been produced by the feeble flickering of a neon tube. 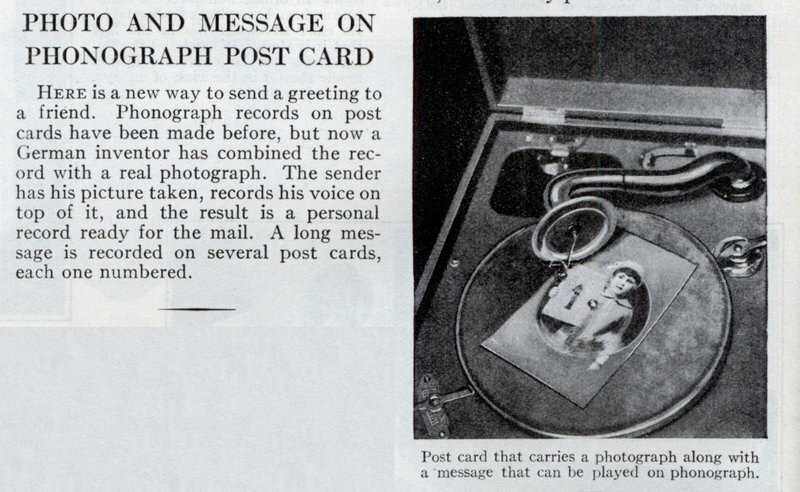 In the future, monster implements of war may be controlled from a distance by the mere turning of a radio dial. 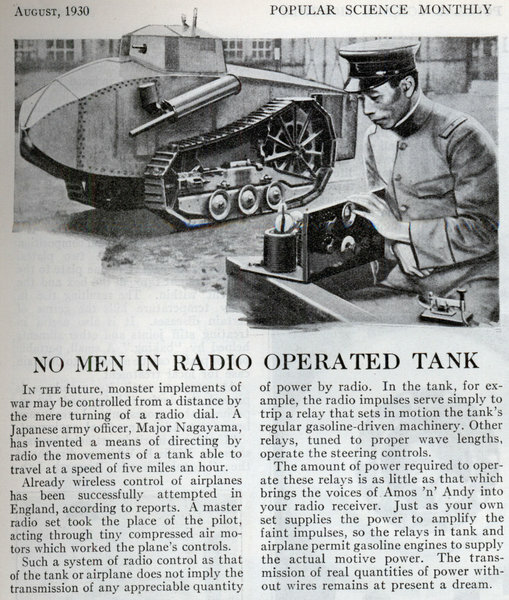 A Japanese army officer, Major Nagayama, has invented a means of directing by radio the movements of a tank able to travel at a speed of five miles an hour. Already wireless control of airplanes has been successfully attempted in England, according to reports. A master radio set took the place of the pilot, acting through tiny compressed air motors which worked the plane's controls. 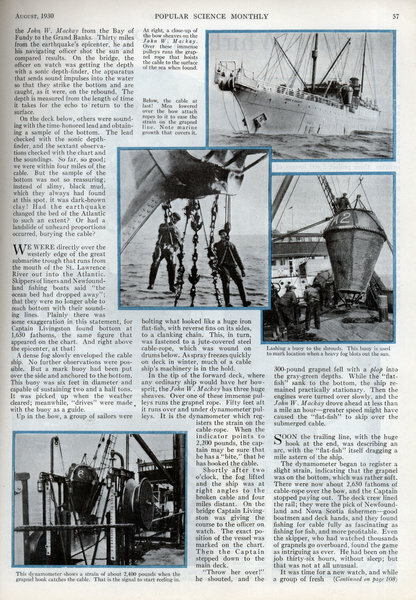 The author of this article went as a member of the crew of the cable ship in order to get this vivid, first-hand story for you. 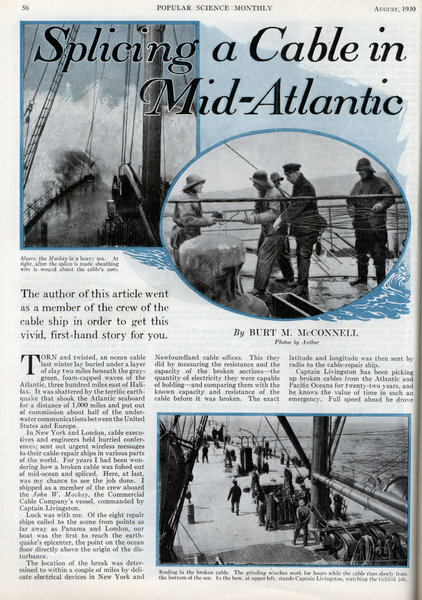 By BURT M. McCONNELL Photos by Author TORN and twisted, an ocean cable last winter lay buried under a layer of clay two miles beneath the gray-green, foam-capped waves of the Atlantic, three hundred miles east of Halifax. 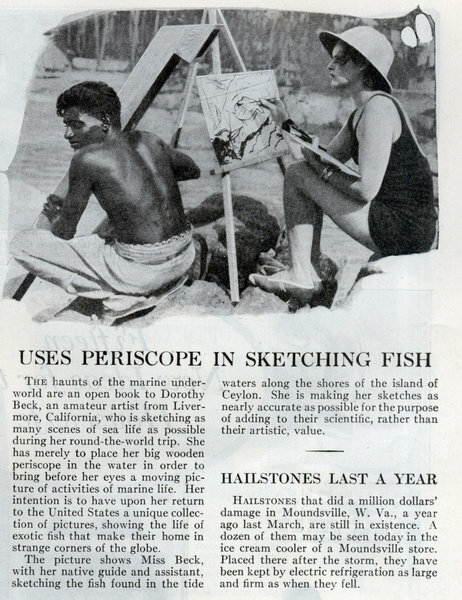 It was shattered by the terrific earthquake that shook the Atlantic seaboard for a distance of 1,000 miles and put out of commission about half of the underwater communications between the United States and Europe. PATS ROUGE ON. Tiresome work with the fingers is unnecessary in applying cosmetics if this new electric machine is used. 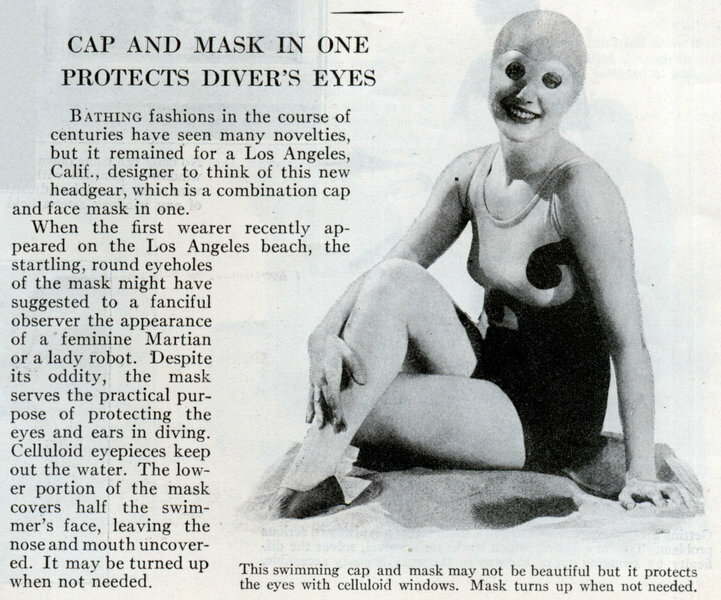 Two soft pads, mounted on vibrating arms, alternately tap the face, landing more than a hundred strokes a minute. The device plugs into any light socket. CARDS CAN'T BLOW AWAY. With one of these tables bridge can be played at the beach in defiance of wind. 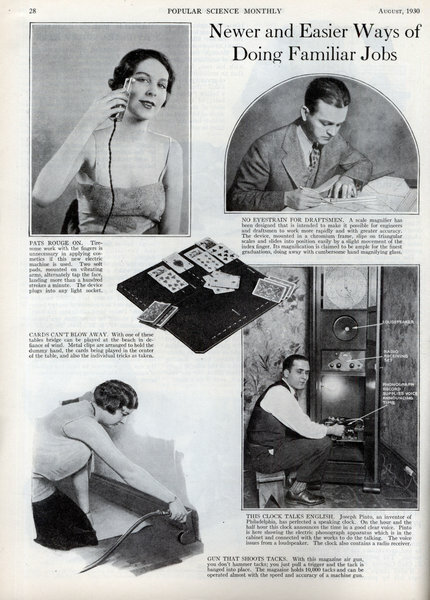 Metal clips are arranged to hold the dummy hand, the cards being played in the center of the table, and also the individual tricks as taken. 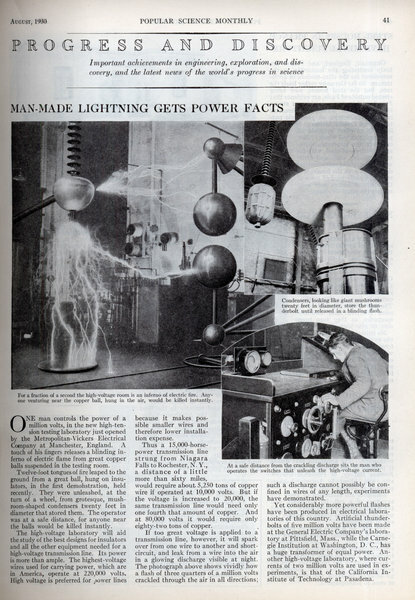 ONE man controls the power of a million volts, in the new high-tension testing laboratory just opened by the Metropolitan-Vickers Electrical Company at Manchester, England. A touch of his fingers releases a blinding inferno of electric flame from great copper balls suspended in the testing room. Twelve-foot tongues of fire leaped to the ground from a great ball, hung on insulators, in the first demonstration, held recently. They were unleashed, at the turn of a wheel, from grotesque, mushroom-shaped condensers twenty feet in diameter that stored them. The operator was at a safe distance, for anyone near the balls would be killed instantly. 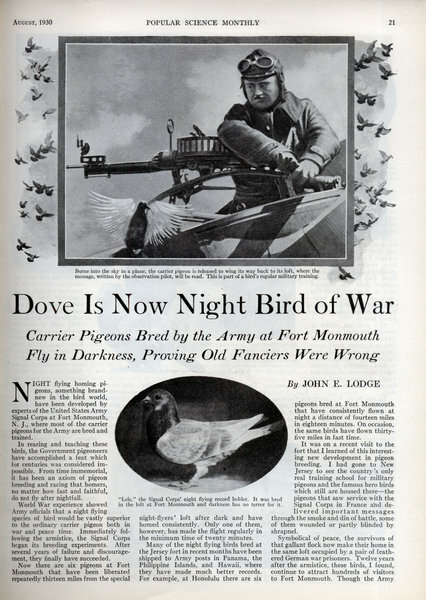 Carrier Pigeons Bred by the Army at Fort Monmouth Fly in Darkness, Proving Old Fanciers Were Wrong By JOHN E. LODGE NIGHT flying homing pigeons, something brand-new in the bird world, have been developed by experts of the United States Army Signal Corps at Fort Monmouth, N. J., where most of the carrier pigeons for the Army are bred and trained. In rearing and teaching these birds, the Government pigeoneers have accomplished a feat which for centuries was considered impossible. 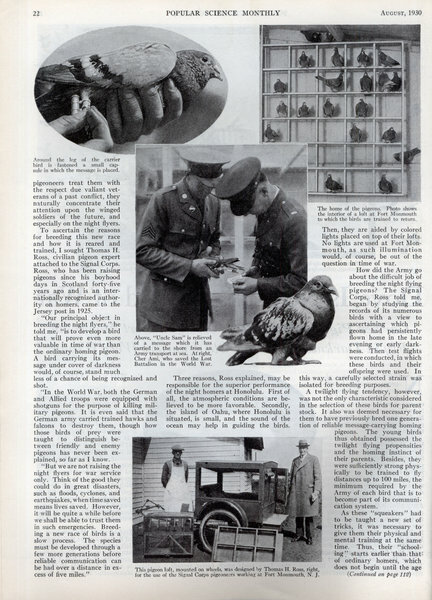 From time immemorial, it has been an axiom of pigeon breeding and racing that homers, no matter how fast and faithful, do not fly after nightfall. A handy receptacle to hang on the wall near the kitchen stove. 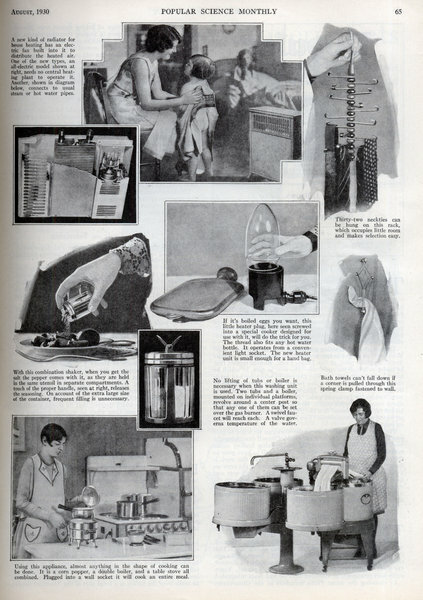 It has three pockets to contain kettle covers and keep them within reach, thus saving steps. Where to put the hot lid of a baking dish is an annoying question, conveniently answered by a metal holder that clamps to the side of the dish. It holds lid securely against danger of breakage. Getting around an ironing board in a small kitchen is always a serious problem. This new board, which works on a swivel, solves the difficulty by swinging out of the way so the work is easily accessible.